Though I really enjoy my Thai and South East Asian curries (such as Malaysian curries), there's another country that is very famous for curries - India! Indian food (which as you'll know is a lot more than just curries) is growing in popularity much like it has in the UK, though ask many an Englishman and they will tell you that the Australian pricing of Indian food is significantly higher compared to what they pay back home. On a wintry Sunday night, I found myself at Buddha Bar Curry House which is located near the busy end of Rokeby Road in Subiaco, dominated by trendy bars, cafes and the Regal Theatre. Bringing its own charm to the area, Buddha Bar has a simple modern interior, heavily covered in dark brown colours and its own large Buddha decoration. As its name suggests, Buddha Bar has a bar complete with beer, wine and cocktails. Though the selection isn't huge, it's still quite decent for your average restaurant, and the range includes mostly Australian wines and beers, as well as a few New Zealand wines, French champagne and foreign named beers. Foodwise, Buddha Bar's menu offers many Indian favourites including tandoori, butter chicken, vindaloo, and even a goat dish. 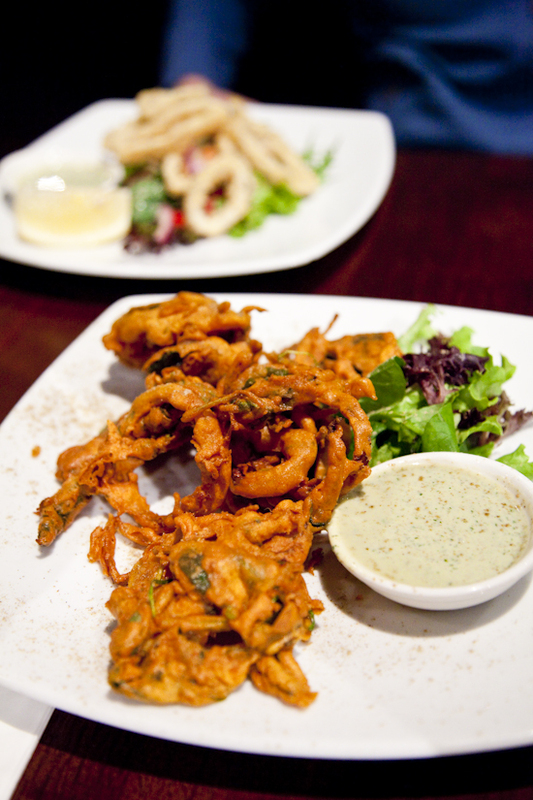 The vegetable pakora were strips clumped together of spinach, eggplant, potato and onion that were seasoned, battered and deep fried, and served with a sweet chilli sauce and minted yoghurt. Although the vegetable pakora seemed well made and seasoned for an entree start to the meal, I found it to be very salty which for me dominated the taste. The yoghurt based dressing helped to cover up some of the saltiness. The vegetable pakora was also served with a side serve of greens which appeared to consist of dry pieces of lettuce leaves that looked unappetising. Suffice to say that I didn't eat any of it. On the menu, this squid dish was marked as being made from Kailis seafood. 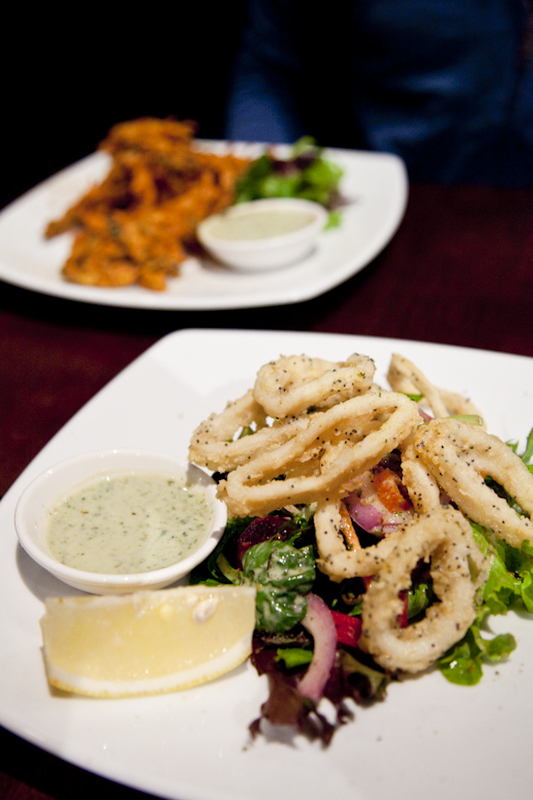 The squid, or calamari rings, were coated with what seemed like a light cornflour base as opposed to the heavier batter in the vegetable pakora as well as poppy seeds, then deep fried. Whilst the squid itself was nice and tender (as you'd expect from Kailis seafood), the seasoning was in stark contrast to the vegetable pakora with the squid being almost bland in taste. For the squid, the yoghurt based dressing (which seemed to be the same as that served with the pakora) helped to add flavour (and fat flavour) to the squid. The side salad that came with the squid was dressed with a Gremolata dressing, making it refreshing and cleansing on the palate. This salad I did eat! 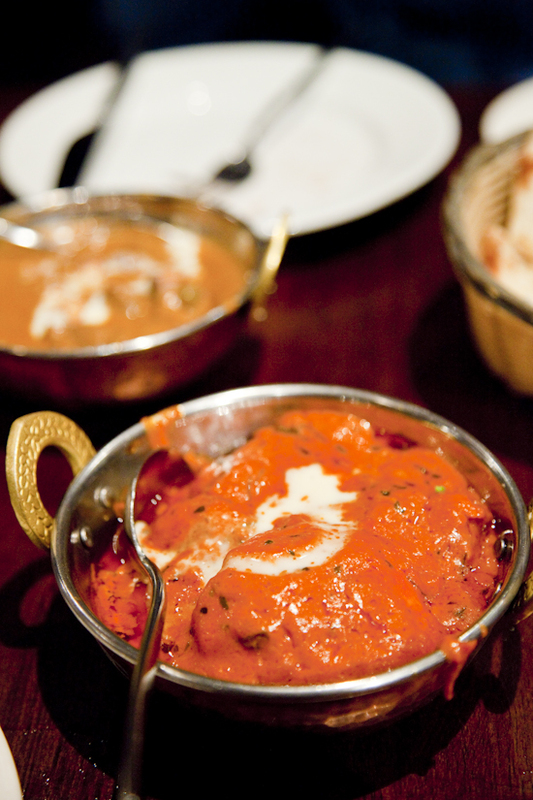 I don't know about you, but I find that almost every Indian food place I go I find the taste of butter chicken can vary a great deal. Overall, I found the butter chicken ad Buddha Bar to be really enjoyable. In the dish photographed above, the chicken was so tender it melted in the mouth, and the rich sauce had a combination of creaminess with tomato, yoghurt, spices and very mild chilli flavours that worked well on my taste buds. On the negative side, I only found 6 slices of chicken buried amongst the sauce. I'm not sure whether the quantity of chicken was reduced for the Sunday special, but it made the dish otherwise hard to justify for value. (As a small note, we ordered a second serving of the butter chicken. The second serving wasn't as tender or as delicious as the first serving but still acceptable). Like the butter chicken above, the lamb in this lamb korma dish was cooked soft such that it broke apart effortlessly and also nearly melted in the mouth. The korma sauce was (I thought) very mildly spiced, but even without a lot of "heat" the spice and flavour in this dish was still good. 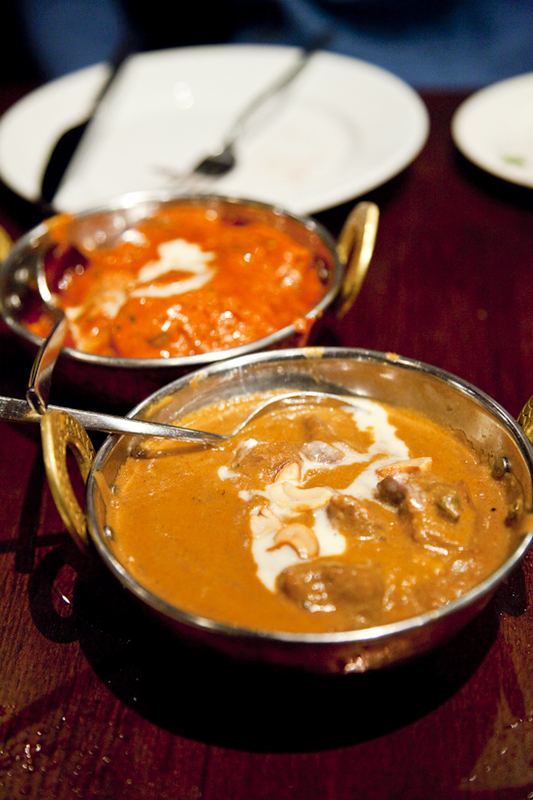 Again like the butter chicken, the quantity of lamb was relatively little, and the sauce was very thick, rich and heavy with decent flavour. 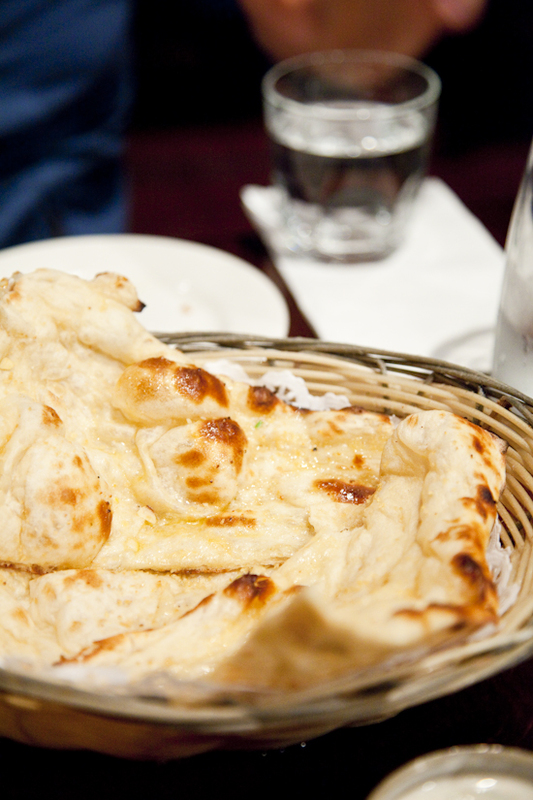 The naan bread was nice and light, a little fluffy, but just a bit oily. Great to help scoop up that butter chicken sauce. Things we liked: Tender meats; flavoursome sauces; good friendly service. Things we didn't like: Apparent value for money; richness/heaviness of some of the dishes. Other things to note: Specials are available during the week including 50% off curries on Monday and Tuesdays, and the $29 all you can eat Sunday special. Have to agree with the comment of it being hard to justify the price if it wasnt for the specials! I've been here before as well, and enjoyed it fine, but wouldnt want to pay full price! mmm soo good.. ur blogpage is as always.. informative! I agree with Jaxstar on this too! Especially since for me curry happens to be hit or miss. It takes a lot of effort to get a curry going right, even if it comes at the price it does at this Subaico joint - you can never be too careful when you play around with your spices!